I seem to have gone pastry mad this past month, particularly with a new enthusiasm for making my own flaky, buttery puff pastry. All sorts of flour – plain, spelt, rye and (of course) bread flour are perpetually on the shopping list. Between bread making and pastry, I seem to be going through prodigious amounts of the stuff. Earlier this month I made a small Galette de Rois – a French “Kings’ cake” made with homemade puff pastry filled with almond cream (crème d’ amandes or frangipane) to celebrate Epiphany (6 January). The celebration is in honour of the Magi, the Three Kings. But, I put off making mine until tad bit later in the month with all the Vasilopita (Greek New Year’s bread) to get through. Whatever the date, the cake came out a bit (I mean a lot!) lopsided. It looked like a mini pastry leaning tower of Pisa. 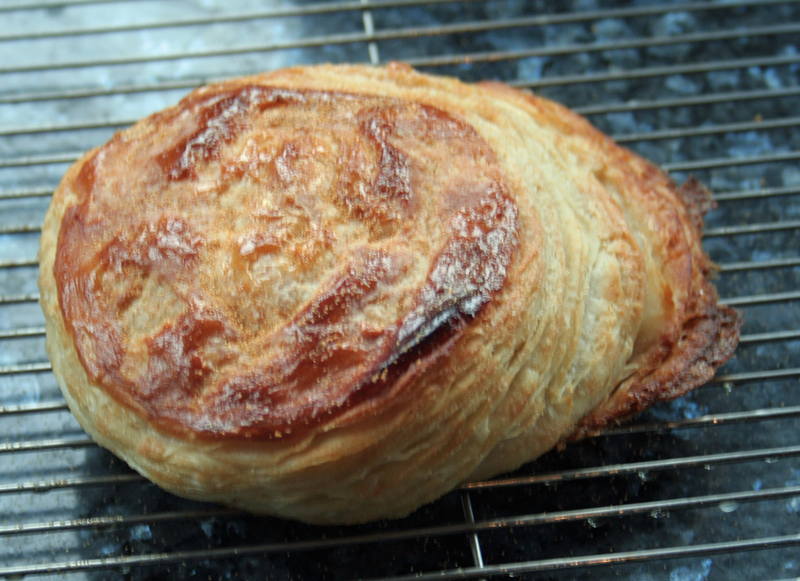 Although, to be honest, from the photo it looks more like a pastry slug. Luckily it didn’t affect the taste, and I think I know what exactly went wrong. There is now a notation next to the recipe for next year. Using up both the leftover frangipane from the Galette de Rois and mincemeat from an opened jar resulted in a lot of little frangipane topped mincemeat tarts. 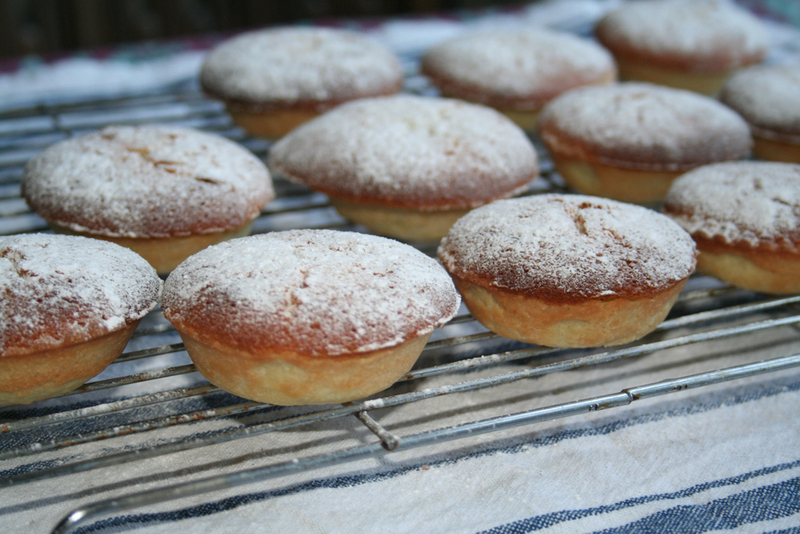 These were exceeding yummy and I suspect they would be delicious with apricot jam – or any other tart fruit filling to counter the sweetness of the frangipane. Earlier in the month, I was reading a post about the poet Emily Dickinson as a baker by the blogger, Revolutionary Pie who specialises in American historical cooking. It is quite fascinating, and Emily Dickinson’s comment that “People must have puddings” stuck with me. By pudding, Emily Dickinson meant dessert and not the more specific and modern North American definition as a milky, custardy type sweet. In fact, this generic meaning of pudding as a dessert is still used today in the British Isles and many Commonwealth countries – often simply shortened to “pud” as a colloquialism. 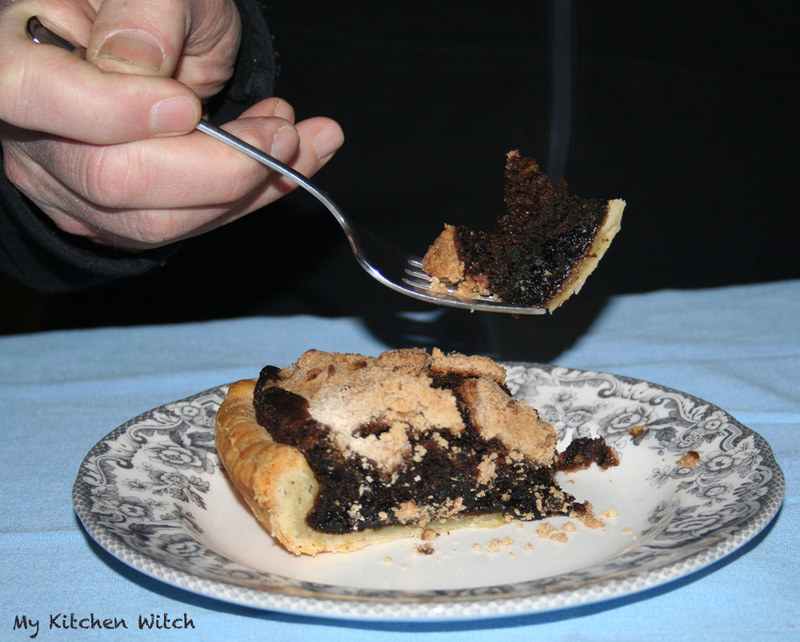 So, in honour of Emily Dickinson, I chose a recipe from my childhood, a molasses-based Pennsylvania Dutch Shoo-Fly Pie with a flaky shortcrust pastry. Recipe to be posted soon, although I may have to make it again as I wasn’t 100% satisfied first time round. Much as I love puddings, one cannot live on sweets alone. 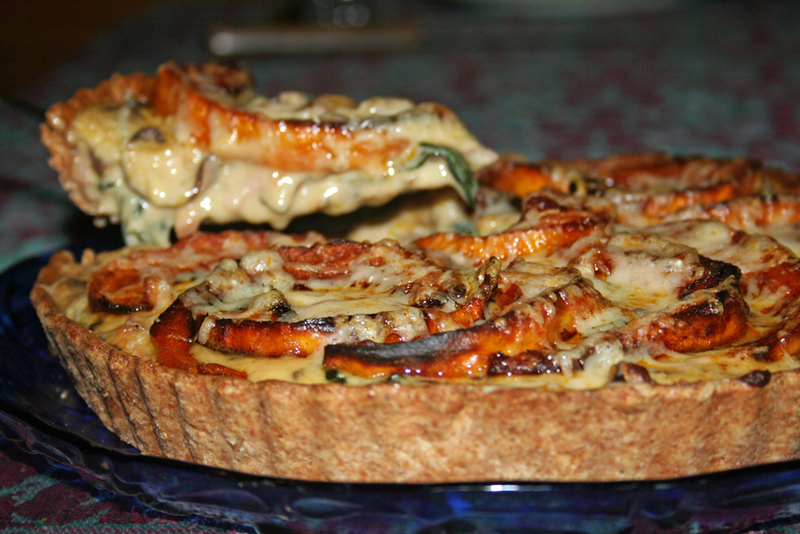 One dinner this past month was a spicy roast squash, Cavelo Nero, and mushroom tart with a creamy-cheesy sauce made with a spelt pastry crust. Somewhere I read that flour with a lower gluten content is better for a flaky pastry, so you can imagine that the spelt worked well here. Also, by pre-baking and then sealing the crust, there was no soggy pastry! It has been a revelation that I’ve been making tarts and quiches all wrong in the past. Just goes to show that there is always something new to learn. 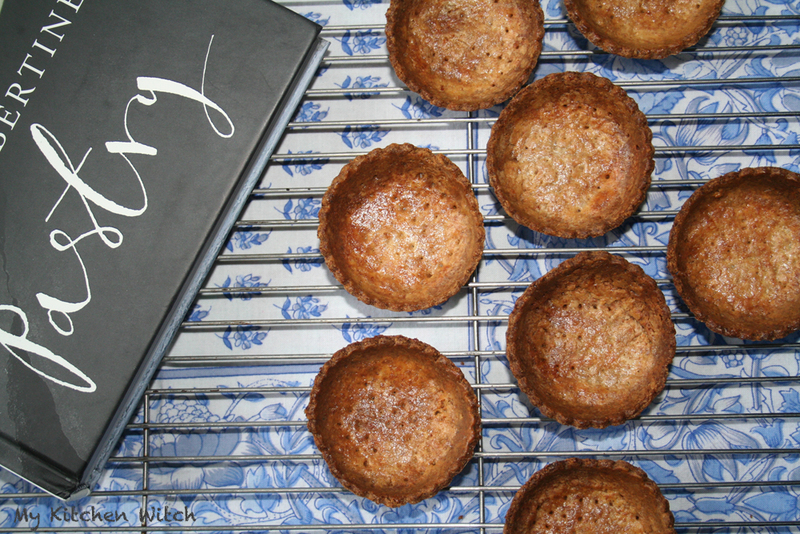 Leftover scraps of spelt pastry were made into pre-baked tartlet shells. They keep well, stored in air-tight containers. They are ready to be filled with dill-flavoured crème fraîche topped with a sliver of poached salmon, or with a dollop of smoked trout pâté, or simply filled with creamy cheese for instant canapés. 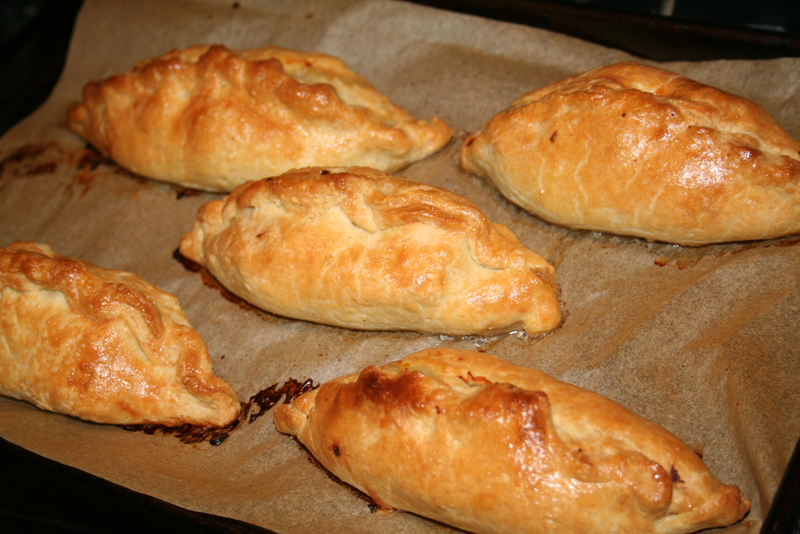 I also made Richard Bertinet’s version of Cornish Pasties – good for a simple dinner. They can be made in batches and frozen before baking. Very useful to have on hand. This version of shortcrust made with margarine seems ideal for any number of savoury fillings, including some of the excess haggis with a bit of swede from Burn’s Night, or even some of the leftover Rajma Curry, originally posted by Francesca @ Almost Italian. The list is endless. Since a friend’s mother is here from Athens, I got a helpful tutorial in making homemade phyllo, another type of pie crust. Unlike the commercial stuff, homemade phyllo is a bit thicker, though still quite thin! It is simply flour, water and a pinch of salt, kneaded until no longer sticky, then cut into lime-sized or small lemon-sized pieces. Each of those dough balls are flattened, then three stacked with a liberal amount to melted butter between before rolling out again – this time very thin so that you can almost see through it. A large pie (pita) requires three such thin sheets for the bottom – brushed with a mixture of butter and olive oil between – and two sheets for the top. 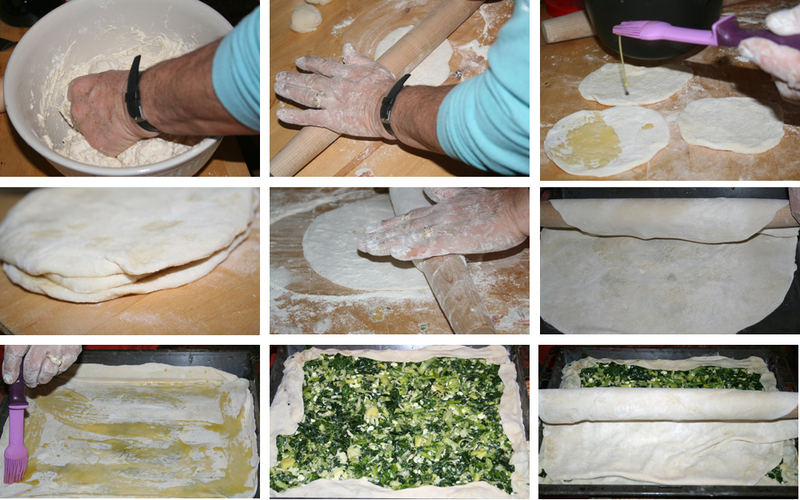 After having seen how it is done, I will definitely need to practise this before making my own credible Greek savoury spinach pie (spanokopita). When I’ve mastered it, I promise a post and a recipe. 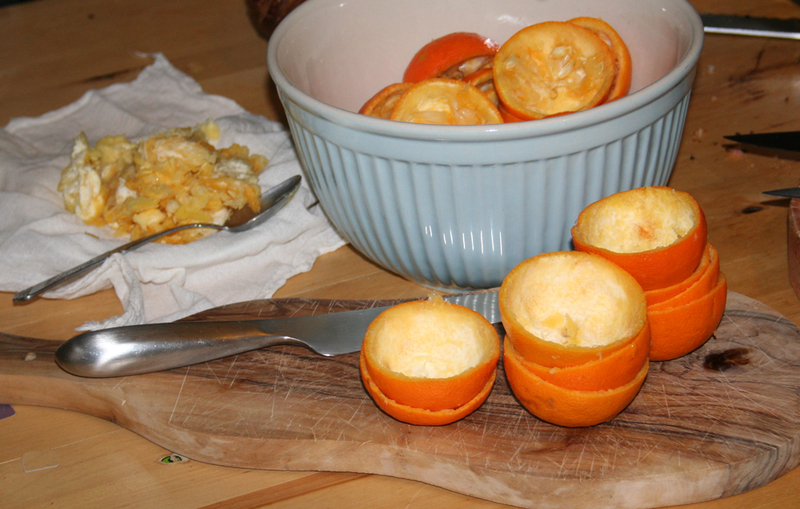 In return, I showed them how to make Seville marmalade. Don’t think that with my current obsession with pastry has made me neglect the annual marmalade making! And, to help with all that pastry experimentation, I have a new bowl to add to my Mason Cash nested bowl set – this one quite large with creamy coloured owls nestled among tree branches. Meanwhile, my own sourdough bread-making is continuing on a regular schedule. With three different starters needing feeding, I never have to buy another loaf of bread again. There is Sven, the 100% rye starter, Vaso, my original Levain made using a bit of Greek magic (which you can read about here), and finally the baby Muriel who came to me from across the world – an offspring of Celia’s sourdough starter, Priscilla. I really need to branch out and experiment – sourdough crumpets and Derbyshire oatcakes, barley pancakes, buckwheat blinis. Whatever is made with yeast seems fair game for the sourdough conversion. Watch this space for Sourdough Chronicles! Amazing and delicious looking! I think I would like to come for dinner. You are welcome anytime. Although I cannot guarantee there will be pastries. I like to space the baking of these little goodies, otherwise I would need to be perpetually at the gym working off all those calories! What an impressive lineup of pastries et al. I look forward to your sourdough recipes. Really loving my sourdough starters. Next up is a conversion of my Derbyshire oatcakes to sourdough. It should be interesting! I see you have been busy as well – all those lacto fermented sauces! I think I have now mastered pastry 101 and I glad to have finally learned how to make a quiche base that isn’t soggy. Delicious!! Pastry is one of my favourite foods…if only I could live on pastry alone! I will look forward to reading your recipe for flaky spelt pastry – I’m keen to try it. The spelt pastry was wonderful. I use a stoneground wholewheat spelt flour which gave it a lovely nutty flavour. The variation using margarine for the pasties was also a revelation – so very different from its butter counterpart. amazing all the things you learn just by doing. I agree with Emily Dickinson – just the smallest morsel of something sweet to end a meal is a must. Very impressed with all your pastry making; I haven’t made Cornish pasties for years but now wondering why not. Thanks for the reminder. You can tell that I also agree with Emily, but we usually have fruit with an occasional sweet which I think is essential even if in small doses. The pasties were great and the haggis + swede variation was fantastic. Got the idea from my son who says they were making the haggis versions at his student union eatery for Burns Night. Am now keen to try the pastry with curry spices. Your comments always cheer me up – so upbeat and funny. Move in at your peril. We live in an old (read that as COLD) Victorian house that is packed to the gills with books. Our son jokes that the books act as insulation, but I’m not entirely convinced. Perhaps this is why I bake so much – at least the kitchen is warm when the oven is on! Have had a lot of fun going through Richard Bertinet’s pastry book and certainly learned a few tricks of the trade. How I would love to live with you, no, hang on, I would put on too much weight, so, tell you what, I will just visit for a while. What wonderful pastries – I am in awe! Ha! The pastry making was very much spaced out over the month for that very reason! I know that they say an extra layer is good for the winter months, but I prefer just to put on a sweater. Had fun with the pastry and learned quite a lot from Bertinet’s book. I notice another Mason bowl- is that there to stir me into fits of envy? You must have the whole set now. Thanks for the nod regarding the Rajma Curry- I can imagine the leftovers in some little pasties, a little beany samosa like treat. Will you be posting the recipe for the pastie pastry as I am always looking for a good one without lard. A great pastry post full of temptation- and very well suited to winter. I couldn’t resist the Mason bowl when I found myself in our local hardware/kitchenware store. There is one more – an enormous one with foxes, I think, but I may need to resort to internet shopping for this. You know, I had samosas on the mind when I thought that the pastry would be good filled with the curry. The pastry is the same basic “salted” pastry in Bertinet’s book, but substituting a solid margarine (not the soft spreading kind) for the butter. It really worked well and actually baked a bit differently that the butter version. I also have an aversion to using lard in pastries although my sister swears by it. You must find the fox bowl. Or I might have a look too. Puff pastry really isn’t difficult to make. However, I may experiment and reduce the amount of butter next time. Do try making it. You may be pleasantly surprised. When put together in one post it does seem excessive pastry making! However, I assure you they were spaced out over the month. Plus (and this is a big plus!) I will let you in on a secret. Many of my pastries get taken to a friend whose husband and little daughter love sweets. As I explained to her, this arrangement suits me well. It gets those calorific things out of the house, but still allows me to make them! As I was just explaining to Sandra @ Please Pass the Recipe, they did seem a bit much when put altogether, but I assure you, the making of these were spaced out over the month! Also, many were taken to a friend who loves any such offerings. I, too, have that same resolution! But, a little bit is better than a lot. One thing I learned from the Latin poets is moderation in all things (Horace, I seem to recall). Found that fox Mason Cash bowl on amazon and it is waiting patiently on my wishlist. No doubt it will migrate to the shopping cart at some point in the near future! I love making pastry, but really need to be rigorous in making it only every once in a while. between that and bread making, my hands never seem to be out of a bowl of flour! I haven’t actually made the phyllo yet – just watched a master do it. She’s been making homemade phyllo for decades and it is second nature to her. No doubt it will take me some time to become even a tiny bit proficient. And, yes, you are right, those little tartlet shells are so versatile. I know you don’t know me, but can I come and live with you? Lovely IMK post. I’ve now had several requests. If I had a virtual house, it would be packed. Nice compliment, though! You seriously amaze me. What beautiful pastries and savory dishes as well. I’ve never seen anyone attempt their own puff pastry, but I’ve always wanted to. I love your gallete des slug. It actually looks perfect. 🙂 How lucky to have had a tutorial like that on phyllo dough too. Love the pics, love what you do in your kitchen. Love your references. I feel like you could write a book one day. Yours would be one of my favorites I’m sure. Puff pastry SOUNDS daunting, but it really isn’t difficult. It does take time – lots of resting and chilling before you can bake with it. Richard Bertinet’s book, simply called “Pastry” lays it all out in step by step procedures with lots of pictures to show how it is done. I think he uses too much butter, so maybe next time I’ll reduce the amount a bit. Had fun making it, though! Very belated thanks for mentioning my Dickinson post. I didn’t realize pudding still meant dessert in the British Isles — good to know. I clearly have to do more of my research in England. 😉 And I also want to come and live with you, but I’ve settled for getting a few Mason Cash bowls. (I gave them to myself for Christmas.) They’re wonderful! I have always loved Emily Dickinson and her poetry. That’s what caught my eye, but I never knew she was such a keen baker – so thanks for your post. The pudding/dessert meaning was very confusing when I first arrived on these shores! So was biccie – a childish shorthand for biscuit (AKA cookie). You will love the Mason Cash bowls! I have only one left to get to complete the set. Watch this space next month. Hi Celia – I really do enjoy writing my IMK posts. They give me license to “blather” on about anything that comes to mind regarding food and my kitchen. I’ve also enjoyed working my way through Bertinet’s pastry book – a lot of useful tips. However, I cannot say that I’ve actually made the phyllo yet – just watched and photoed my friend’s mother expertly make and roll the dough. Homemade phyllo is a completely different animal from the fine store-bought stuff. It is the way it always used to be done – documented back as far as the 13th century (and possibly earlier). It was only produced mechanically around the middle of the 20th century allowing the sheets to be paper thin. I am going to try it, but need to steel myself for an all morning session! Cornish pasties. My fave. 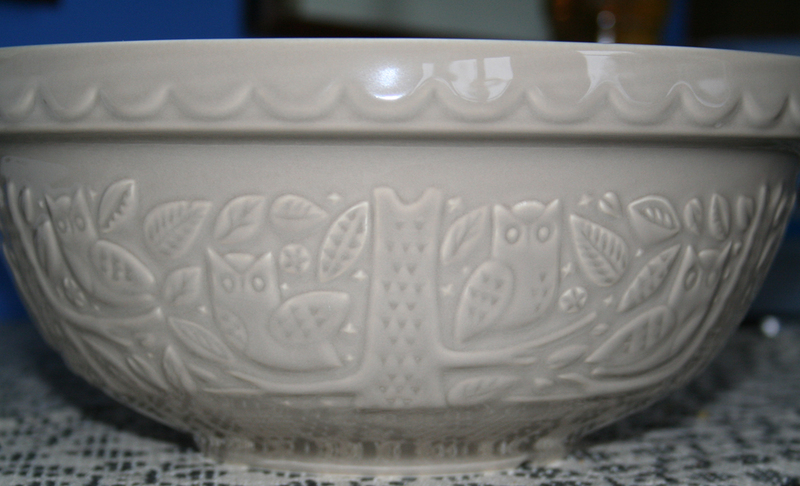 Love your owl bowl. I have the green hedgehog one and I am keen to get the others. They are so gorgeous. Love your little tartlet shells too. The Cornish pasties were great. The ones we froze and later baked were even better, although I still can’t figure out why! I love my little hedgehog bowl and the others I have, too. Only one more to go in the series – the whopping 29cm bowl with foxes. Hi Kim, I’ve always been partial to root words, particularly those that pertain to food. That reminds me of a small (now defunct) soft drink bottling company in South central Crete called Θαύμα – the root for words like thaumatology, meaning miracle – somewhat similar to the Magi, wouldn’t you say? I wish now that I had kept one of the bottles! I’m still gearing myself up to try to make homemade phyllo. My friend’s mother made it seem so easy.